Home/desk-mounted panels/Is MoneyWatch on the Money about Cubicle Work? Is MoneyWatch on the Money about Cubicle Work? Have you read the article by MoneyWatch contributor Amy Levin-Epstein about how to concentrate while working in a cubicle? We all know that focusing at work is difficult when you sit in close proximity to other employees. What’s new about this piece is that the author asked a couple of ADD/ADHD experts for their opinions. Attention Deficit Disorder and related cognitive disorders aren’t just confined to children. Kids who have trouble sitting still and paying attention in school are also likely to be bored and easily distracted on the job when they grow up. That’s a problem that can take a big toll on an employee’s productivity and their chances for career advancement. The open office environment that’s become increasingly popular with facility designers poses special challenges for those who have a short attention span. The whole idea of the open office is to create that “buzz” and get people to interact with each other more. But for a person who is having difficulty staying on task, this is far from helpful. Amy’s article talks about a few ways to cope with visual and audible distractions at work. One suggestion is to create ‘blinders’ in the workstation that reduce the tendency to look around at every distracting movement. This approach has the added benefit of cutting down on outside interruptions. If coworkers can’t easily see an employee, they are less likely to try to engage that person in conversation. The suggestion to use potted plants to block the view is nice, but not likely to be that effective. Plants don’t serve as much of a barrier and they take up floor or desk space that could be put to better use. In contrast, desk-mounted privacy panels take up very little room on an open workstation. 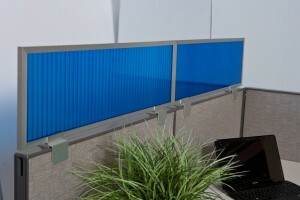 Cubicle panel extenders are mounted on top of existing walls, so they don’t take up any footprint on the desk at all. These products are specifically designed to block visual contact and reduce racket to help employees concentrate. If you have a worker with ADD/ADHD, this might be a wonderful gift to give them a boost toward greater effectiveness at their job.